I don’t know why, but last week I decided I wanted to make a small series of preservation jars with eyeballs, hearts and brains in it. 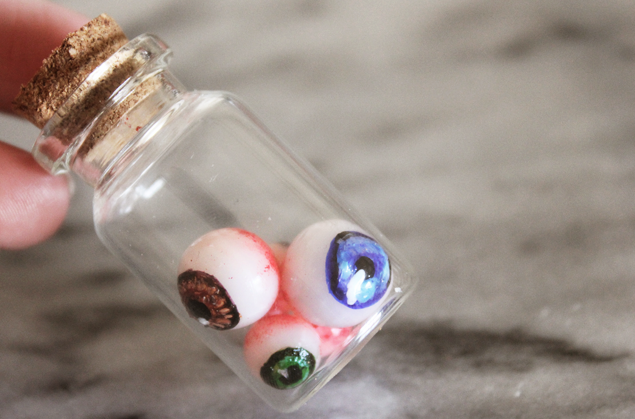 Today I started with an eyeball jar, yes, I know it’s a little more appropriate for Halloween, but I think you guys know I don’t like to box my videos into seasons. I was originally going to make it into a necklace, but now I think I’ll just keep them (when I’ve finished the set) as a decoration on my desk. Seems like a good way to warn people what kind of house they’re in before they get too comfortable.